I am just beginning to explore this topic. After listening to the What’s Your Grief podcast on the topic I was writing down some of the secondary losses. The more time that passes the more secondary losses I notice. But what does this mean? In my case the primary loss is the death of my husband. But there are all the small things, the nuances, the people who surrounded us as a couple, the friends who simply don’t know how to handle grief, etc that may also become losses. 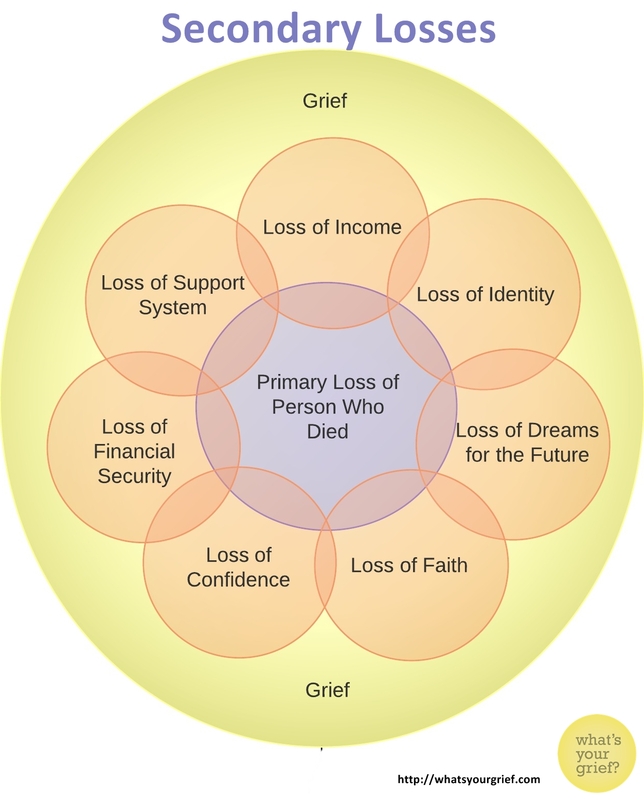 Here is a great picture from www.whatsyourgrief.com that helps to show what we are talking about. Considering making your own list of secondary losses because it is important to also grieve these. Some are of course more important than others, some have a ton of impact, some do not. Some of these things can be as hard to grieve as the primary loss or wrapped up so closely into it. I have a feeling this is a post I will add to. This list is still probably being developed at this point. The reason it isn’t done is to be honest I did not think about the secondary losses in those terms until the podcast. Consider taking a listen now. Great post. Most people don’t realize that you lose so much more than the person. You lose your life, security, innocence…the list goes on. Thank you so much for the encouragement and the following!! Eight years ago and since then, I have noticed and grieved those losses. However, I have so many new friends that I have more faith in than ever because they pulled me out of despair. I meet people wherever I go that I realize have this “loss” connection with me. When you are done grieving the losses (I want to clarify that I agree with the importance), I hope you will start a gratitude journal for what still have and for the all joys you are able to embrace as you go through this journey. Sending healing thoughts.